The Healing Clinic Collective is in a period of Grassroots Fundraising to raise funds to cover the costs of our 2019 programming! Make a donation today to support the work of the collective and receive a hard copy of the HCC Practitioner Directory or Guide to Organizing Healing Clinics below. Since our first clinic in 2013, over a dozen large and small-scale healing clinics have been directly inspired by our work and we continue to receive requests to organize similar healing clinics from communities around the state, country, and internationally. Because we are a majority volunteer organization, we do not have the capacity to organize clinics for communities beyond the Bay Area. To support the growing movement for Healing Justice and closing the gap between sacred and political work, we are thrilled to share our philosophy and planning process with others so that they can envision and recreate healing spaces that serve their communities. We are so happy to release a fully designed and carefully curated roster of healers in the Bay Area pooled from our dedicated network of over 130 practitioners of 46 distinct modalities who are here to support the healing of our community. This resource is made possible through longstanding relationships with healers in the Bay Area who are aligned with our values and offer free/sliding scale services to people referred through the HCC network when possible. We are honored to continue doing the work of Healing with the People in our communities and sharing resources through HCC projects and collaborative events this year! Please check out some exciting new resources we want to share with you. Have fun exploring the new website and we look forward to hearing from you! The HCC Core Members have reflected together and feel the call to focus our collective prayer and love on healing from sexual and gender-based violence this year, including violence towards Mother Earth. The collective courage and awakening all around us to confront patriarchy and it’s impact on on the bodies, minds, hearts and lives of womyn and gender non-conforming people is strong, and we want to meet this awakening with intention and healing. Check out our interview with our friends at Las Brujas Radio! Carla Perez (HCC) and Sharena Thomas (HCC & People's Community Medics) got to sit down with the amazing women of Las Brujas Radio, the "DIY bruja femme radio talk show" hosted here in the Bay by Queens D.Light, Imani Atlantic, and DJ Namaste Shawty. The Radio show is dedicated to art, ritual, uplifting one another in community, and decolonizing and reclaiming the ways we heal. LBR interviewed Carla and Sharena as they prepped for the 2018 Fall Healing Clinic. They talked everything from personal journeys with ancestral medicine, to the story of People's Community Medics, to self care, and to the power of collective earth based healing practices in our particular moment in history. It's an inspiring listen that will have you feeling moved, snapping your fingers yes, and laughing along. Thank you Las Brujas! ​​We are excited to share with you our feature in The East Bay Express in a beautiful article called, "Self-Care as a Political Act." The article highlights holistic wellness practitioners of color in the Bay Area holding the work as both sacred and political. You'll hear from HCC family like Carla Perez, Rachel Bryant, and Atava Swiecicki Garcia of Ancestral Apothecary, in addition to other folks who inspire us in the Bay like Daisy Ozim of Resilient Wellness, acupuncturist Paolo Flores Chico, and herbalist Elokin Orton-Cheung. Please join us in supporting our dear friend and comrade, Angela Angel. The mother of our dear friend, original core member, and network practitioner, Angela Angel, fell ill recently without warning, and passed away mid-August. We ask that you join us in sending her and her family our love and healing energy. Please consider donating to support her in covering costs for the memorial, medical bills, and other necessities such as keeping her house and having space and time to grieve. No amount is too small, and it is with gratitude that we give back to this incredible healer in our community. In love and light, we uplift Aurora Alma, Angela, her family and loved ones. This fall on October 13th at Roosevelt Middle School in the San Antonio District of Oakland, we held our 13th Healing Clinic since 2013! What a blessing! This year the clinic was named Healing Our Past, Claiming Our Future, and we came together with People's Community Medics to uplift the prayer of healing specifically from sexual and gender-based violence. We were joined by our elder Simbwala Schultz who led a Healing Circle as well as Hand-to-Hand Kajukenbo who facilitated an emotional and physical self defense training before the healing clinic. There was an amazing group of practitioners from our network and we also got to connect with new practitioners in community as well! We give thanks for all of the community that came to receive healing, the many many volunteers and practitioners who made this day possible, the organizing committee, and all those who supported this dream along the way! The Collective Held Our First Healing Retreat This Fall! ​We are honored to be able to say that the HCC held its first ever two-day healing retreat for womyn, 2-spirit, trans, and gender nonconforming folks this August in Sebastopol and Resilient Wellness in Oakland! Healer, medicine woman, and long time friend of the HCC, Veronica Iglesias, led a beautiful, fun, and deeply transformative weekend with an amazing group of participants! Using her deep knowledge of the Nahuatl cosmology and indigenous Mexican healing traditions, including holding space for a powerful temazcal ceremony, Veronica guided us through the world of the feminine archetypes of Nahuatl cosmology and how to harness the energy of the archetypes for personal power and healing through sexual and gender-based trauma. We had a very sweet and powerful Network Gathering this year! We made offerings to the fire for our prayer of healing from sexual & gender-based violence, shared HCC updates & resources and continued building our relationships. Enjoy this beautiful slideshow of photos from the Gathering! ​Appreciations and Highlights of the Black Joy Parade in February! 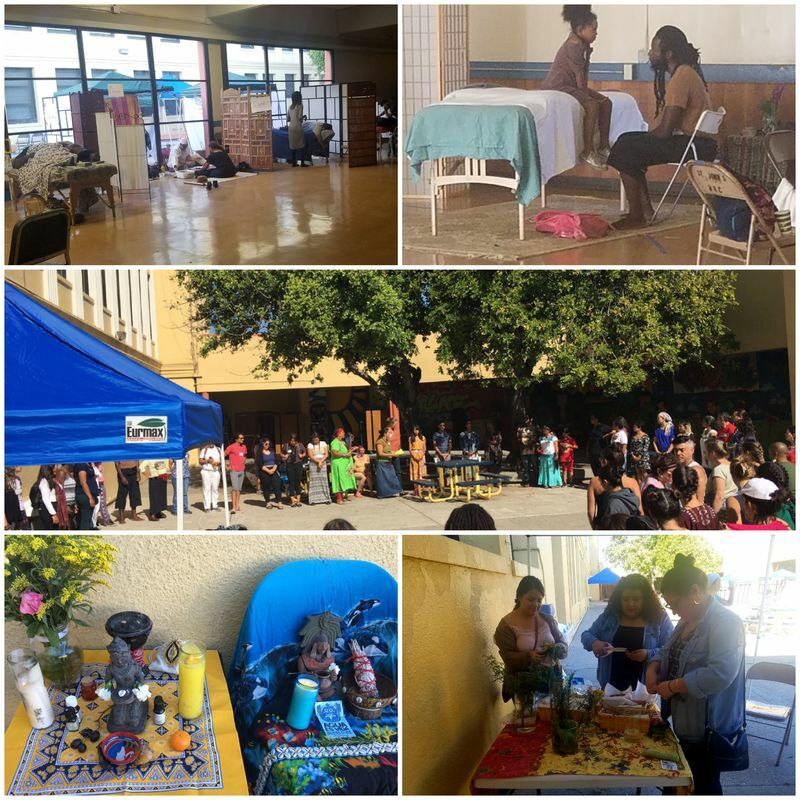 This past February Healing Clinic practitioners and volunteers were invited to run a healing village at the Black Joy parade in downtown Oakland. The parade and energy was filled with Black Joy and the clinic was honored to hold a healing space as part of this vision. Huge thanks to Keena Romano for her work in coordinating this day and to all the volunteer practitioners and volunteers for helping to make this happen! ​2017 was an incredibly generative year for the Healing Clinic Collective! Our work was desperately needed this year with all of the political, social and ecological upheaval that the global community has experienced, and that we are contending with in the US and right here in the Bay Area. In 2017 we focused on collaborations with healers and community based organizations that wanted to integrate holistic and natural healing into their political organizing work. We collaborated for 6 Healing Clinics and events this year – the most we have done in one year thus far – as well as other learning and healing activities. Each was special and reflected the unique way in which various communities are engaging with healing at this time. We also welcomed several new amazing volunteers and practitioners into our Network! Led by our 2 resident Midwives, the Healing Clinic Collective held a 4-part series of ‘Remembering Circles’ with birth workers of color from our Network. These Circles served as a space for birth workers who focus on culturally traditional methods of childbirth and prenatal/postnatal care can share their learnings with each other in a safe and generative space. The HCC honors the oral tradition and the apprentice model of learning old world, holistic ways of caring for pregnant people and conducting the ritual of giving birth. Birth Workers of color within our Network were able to discuss important topics that exist in the world of midwifery, as well as share skills with each other. Most exciting is that we were able to bring in a traditional healer from Mexico to teach us how to build a temazcal, or earthen steam bath, to support birth workers and birthing mothers. We held our 3rd Annual HCC Network Gathering at Carla’s house. This year we took advantage of our Network Gathering to acknowledge the state of panic that many of our communities were in after the presidential selection. We made offerings to the elements and sent out a unified prayer of LOVE in order to bring balance to all of the fear that was being generated at that time. We ate, built relationships, made prayer flags and art and connected to Spirit. It was beautiful! On June 3rd we held our first Healing Our Healers Gathering in Oakland. This collaboration with one of our beloved Network practitioners, Dr. Neferkare Khreme, different type of healing space intended to support the healers, educators and organizers that work directly with the communities that are being targeted the most intensely by the new presidential administration in the US – including undocumented people, QTPOC people and others. Fifty Healers from our Network as well as practitioners, educators and organizers from within and outside of our Network joined in a group healing provided by Dr. Neferkare and then enjoyed traditional food soaks to integrate the healing and experience some relaxation and care. Our first collaborative Healing Clinic took place in Richmond and served grassroots member-leaders from CBE’s East Oakland and Richmond membership. CBE organizes with families on the fence line of polluting industry, working to reduce industrial pollution and protect community health. CBE was an important partner in planning for the 2016 Beloved Community Healing Clinic and it was exciting to take our work together to another level! This Healing Day was part of CBE’s 2017 Summer Leadership Academy and served 30 of it’s most active member-leaders. In August we held our second Richmond-based Women’s Healing Clinic. This Womyn’s Healing Clinic (WHC) was held in collaboration with Building Blocks for Kids Richmond Collaborative (BBK), our co-hosts for the 2014 Richmond WHC. We served 150 women, predominantly from the Iron Triangle area of Richmond, as well as from several other Bay Area cities. The HCC played a collaborative support role for the annual XRYSALIS gathering in the North Bay. XRYSALIS celebrates and connects Queer, Transgender, and Intersex People of Color (QTIPoC) and is committed to self-celebration, community building, and most importantly, collective healing and restoration. The HCC was proud to send lots of healing clinic supplies as well as practitioners and volunteers from our Network to help make this healing space happen. On September 30 the Healing Clinic Collective had the great joy and privilege of collaborating with Movement Generation (MG) to offer the Movement Generation Healing Clinic (MGHC). MG is very special to the HCC, being it is the initial sponsor that housed the HCC when it was just budding as a project. MG is also our political home and partners healing the separation between people, the Earth and the Spirit realm. The MGHC served approximately 100 people, with our outreach focused on members of the labor movement working to shift industries away from destructive projects such as the Dakota Access Pipeline, organizers in the Movement for Black Lives and members of the HCC Network. This Healing Clinic doubled as an MG Earth Skills training, providing 5 different workshops focused on the healing arts followed by a traditional healing clinic. HCC Network members were able to participate in workshops and volunteer for the clinic.